Thistledown is quite simply magical. 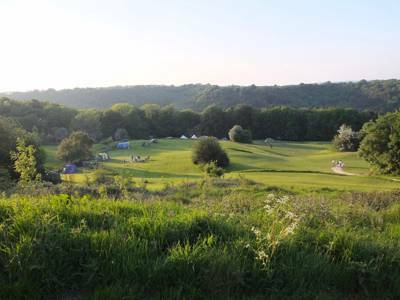 More than just a beautiful campsite nestled among 70 acres of organic meadow and woodland, it is inspirational too. A dream realised by Richard Kelly, who has years of experience in environmental design and construction, Thistledown has been nurtured since 1993, when Richard began creating habitats for the wide range of local plants and wildlife. For years he then ran the site as an environmental learning centre with his son Ryan, before branching out into additional events and opening the campsite’s well received café that sources ingredients from the local area. It’s easy to locate Thistledown: just head towards a majestic wind turbine located 300 metres from the entrance. The turbine was one of the first to be erected by the increasingly popular Ecotricity, the UK’s first provider of mainstream renewable electricity, and is a sign of the campsite eco-friendly ethos. It’s a part of the genuine green vibe in this neck of the Gloucestershire woods, so if you’ve ever fancied living the sustainable Good Life, then this is probably the place in which to settle. In the meantime you can camp in three main areas at Thistledown, with up to 75 pitches available in total. But don’t for a minute think that you will be crowded out. The whopping 70 acres available take in trees, undulating pasture, glades of wild flowers, and space – everywhere. Even if there’s a big group of noisy kids larking about in one of the pastures, with all the tree cover it’s unlikely you’ll even be aware of it. 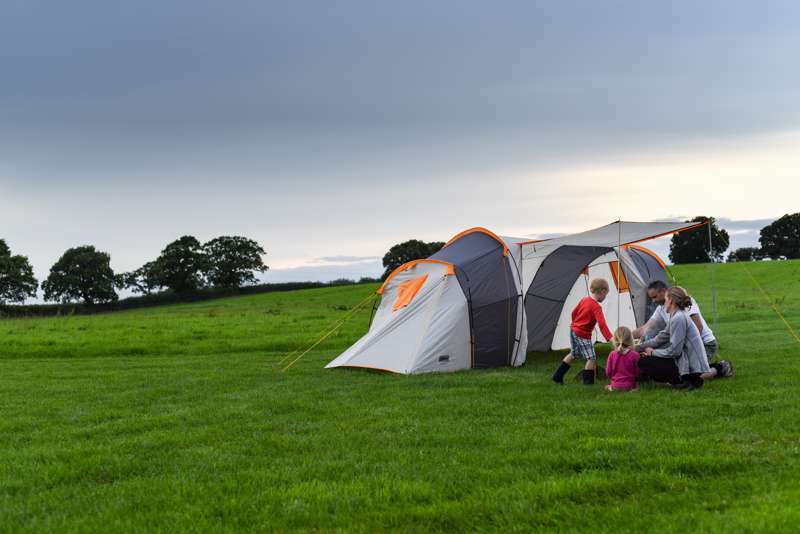 The top site allows cars and offers camping on pitches individually mown into a pretty elderflower orchard, while the bottom two pastures are car free. Perfection. You can stretch out knowing nothing (save the odd startled deer) will drive into you. And for those with children, real freedom is a reality here. The pastures are flanked by woodland offering numerous opportunities for lengthy walks, nature watching or just some good old-fashioned hooning around. Most pitches have their own firepits and in the evening Richard whizzes by selling wood by the bagful. You can take your own bags when he’s not around, but are asked not to collect branches from the woods as it provides shelter for the snakes and slow worms. Picnic tables are dotted around for campers – a perfect place to plonk yourself while you enjoy the tranquil environment, stunning views and the nature trails on offer. Streams gurgle in the background (rope swings near them offer extra excitement) running down from the top of the site towards and old pond at the bottom. It’s in the upper area that the new café is located, home to not only some of the best coffee in Gloucestershire, but also a wood-fired, clay oven, built by Richard and Ryan themselves. Homemade cakes, cream teas and patisseries are on offer, alongside fresh pizzas and slow cooked meats that they cook in the oven over night. The pair have applied their same gusto for the campsite to creating the café – special events are run with guest chefs, new poly-tunnels are being built to grow more herbs and salads and the menu is frequently changing – so it’s no surprise the place has already become hugely popular. Really it’s an echo of everything that has gone before. A respect for the local area, a little innovation and a bit of hard work to create somewhere that every visitor wants to return to. Thistledown offers environmental camping set in 70 acres of Cotswold woodland and pasture. We have no allotted pitches, but there is plenty of space as numbers are strictly limited, and everyone can have their own campfire. We now also have Fieldfare Café onsite - open Friday - Sunday and throughout the summer holidays. We pride ourselves on our excellent coffee, and on Friday and Saturday evenings we serve pizzas cooked in our wood-fired clay oven. The café uses free range, local and Organic produce where possible. In the café there is also a shop stocking local award winning produce as well as camping essentials - everything from local beer to toiletries and free range meats to tent pegs! There is a firewood delivery most afternoons so you can wait at your tent for the wood to come to you! We run courses and events throughout the year, so check the events calendar on our website to see whether we have a foraging morning, a story session, wild butchery days or more during your stay! All of our camping areas can be privately hired for groups camps - please email us if you are interested in doing this. A really lovely woodland site with generous pitches. Set in great countryside and good base for Stroud and surrounding areas. We took our dog in April and wasnt over crowded with other campers. Great eco feel and would go again. Perfect, organic, happy camping. I love it!! Just back from 4 days staying here with friends and our children. Absolutely loved it! The people running it are incredibly welcoming and enthusiastic and do everything possible to make your stay enjoyable and relaxing. The limited numbers mean lots of space, some privacy and your own fire pit. We stayed in the 3rd pasture surrounded by beautiful nature including rabbits, an owl and resident glow worm (didn't see the badgers or deer this time). The facilities are excellent, clean and environmentally friendly. There's a wonderful shop selling groceries and ice-cream and the site is kept spotlessly clean with regular rubbish collections. The location is perfect with Stroud nearby as well as the beautiful Selsley Common with grazing cattle and stunning views. Lot's of choice for countryside walks through the neighbouring Woodchester NT property. Highly recommended! This site is absolutely delightful. Rolling acres of impeccable fields, loads of space so that you can pitch in your own little haven away from any crowds. Firewood is delivered and rubbish/recycling is taken away by charming men in mini tractors. This all comes at a price. Paying for both numbers of people AND numbers of tents (ireelevan of size, it would seem) is a little unfair, day visitors cost have to pay £4 each for the privilege of visiting their camping friends, and the cost of most things is very much pitched at the upper end of the market. We stayed here with group of friends a while ago but plan to return soon as it's close to where we live. This eco-campsite is the perfect place to get away from it all. No cars are allowed on site but the farmer will help you transport all your kit. Each pitch comes with a fire-pit and you can buy wood on site. Ladies: the compost toilets are pretty odourless and a small bunch of wildflowers even give them a kind of boutique feel. With virtually no light pollution we enjoyed the stars in all their magnificence each night and the kids loved every minute. Remember to pack the marshmallows! Wonderful long weekend stay at Thistledown Farm. The team couldn't have been more welcoming and everything has been fully thought through to make sure our camping experience was easy and enjoyable. Pitches are informal but there's so much space kept within the site at all times that everyone is easily able to have privacy and space, we had a lovely glade with a stunning view all to ourselves. The shop is brilliantly stocked and we took full advantage of the fresh bread and pastries each morning, as well as the local bbq meats, chutneys, cakes and beers. Facilities were immaculate and we enjoyed the novelty of the eco experience for a weekend. Overall a thoroughly welcoming and relaxing experience in a stunning rural location, with an easy walk to the great Rose & Crown pub in Nympsfield, where the food is very much recommended! Cirencester was also a great day out nearby, filled with great independent shops and restaurants. Would recommend a stay at Thistledown to anyone! We spent a fabulous early May Bank holiday weekend at Thistledown with friends and children aged 6-14. In spite of dodgy weather, we all had a relaxing time. It was great being able to cook all of our food over an open fire (including locally sourced venison sausages from the shop), enjoy walks from the site, appreciate the wildlife and there was plenty of room for the children to roam and explore. The big pluses for us? Not having cars driving in and out all the time and quiet at night. We really appreciated the obvious care and attention to detail that make the difference between a good and bad camping experience: clean (composting) toilets, hot water, mown grass, friendly staff and a warm welcome. We stayed in the second pasture, using wheelbarrows to transport down the hill and making use of the fabulous off-road buggy to get our gear back up. We spent the two nights around the summer solstice at Thistledown and it was perfect - long hot summer days, cool pleasant star-filled evenings. Like all the other reviews say, pitch anywhere, see few people, have campfires... We were in the Elderflower orchard as we had friends with a campervan and it was a great place to stay. The kids could roam around and play to the hearts' content. The shop and facilities are great and the local pizza shop (Sloppy Joe's, or something?!) delivered massive pizzas to the site. The site is so large that you can go for walks and always find something new. We are definitely going back - we couldn't recommend it more! Seriously, this place is perfect for those who want to experience camping exactly as it's supposed to be done. Quiet and relaxing located in the middle of nowhere. Friendly staff when you arrive and throughout your stay bringing wood and weather updates and a great shop offering local ice creams, meat, milk etc. There is so much space here and you are free to pitch wherever you like. We had a whole field to ourselves and wandering around the site, everyone else had the same opportunity. Your own bit of paradise. We couldn't see or hear anyone else from our pitch. Perfect. Fires are actively encouraged with fire pits located throughout the site and wood from the owners. With no light pollution, the nights are magical and quiet. Perfect for star watching. I will be returning soon. Beautiful site with tons to do: visit the piglets and lambs, walk the bluebell woodland, sit by your camp fire and watch the clouds pass whilst sipping a beer. A hard life made simple by the perfect balance between nature and comfort. Oh and the shop is well stocked and was experimenting with wood-fired pizza's on our last visit. We had a lovely stay here on a summer Sunday and Monday night in June. There were only 2 other tents in the field and so you feel like you have the whole place to yourself. I'm sure it gets busier at the weekends and school holidays, but one of the staff told us it never gets overcowded because they limit the number of tents in each pasture. Although you have to wheel your belongings to your pitch in a barrow, it is so much nicer not having cars in the camping area. Also we paid £5 to have the buggy drive us back up the hill when we left! Each pitch has a campfire and you are surrounded by trees and lovely views! Great walks and Lots of lovely pubs in the nearby areas - a short drive away to some great gastropubs. Try the potting shed in Crudwell (gorgeous!) or the ragged cot in Minchinhampton. Stroud and Cirencester have big supermarkets to stock up on BBQ food and the thistledown shop has some amazing organic bread - well worth trying! Oh yes and the toilets and showers were very clean and showers were hot! My boyfriend and I stayed here over Easter weekend and really really enjoyed it. You can have an open fire pit in your pitch which makes camping extra special. Its a great quiet eco friendly site with great views and really nice friendly staff. I would HIGHLY recommend staying here and I would happily go back there. Also the farmers market on a Saturday morning in nearby Stroud is a brilliant place to get your organic lush supplies. There are some lovely walks and country pubs surrounding the site. A REALLY LOVELY site indeed. Just wonderful. Acres of space, a Roman spring and a soft base in the elderflower orchard: bliss! This oasis is just lovely. We started going with two other families in 2011 and now its an annual event. The last time we visited, a local Fair was being held in Nymspfield on the Saturday. A traditional country event that just made our weekend. The owners of this campsite aim to not overcrowd, so even on the most busiest weekends, you feel like there is plenty of space. However this does mean you need to book early, as you will miss out otherwise. The one thing you have to know is that you can't park your car on the lower camping fields. We chose to wheel our things down in a wheelbarrow, but we should have asked them to drive us down. Much easier! Jul 5, 2013 by Kathi L.
This is by far one of the most beautiful places in the UK. My family and I live local to Thistledown and regulary have an overnight stay, the most recent being for my son's 10th birthday. We took him and 4 of his friends, in sub-zero temps, for a night camping and marshmallow toasting. They played in the woods till dark, giggled at the compost toilets, got wet feet in the stream, and were all asleep by 10pm! We love it here and I feel a little sad that I am sharing how truly wonderful it is as it is no longer our little secret! We travel 15 minutes up the road and feel like we are on holiday. Wonderful for celebrations, breaks with kids, or couples. A thoroughly lovely place with lovely owners. Maybe we will see you there. Cannot recommend enough. We first stayed here a couple of years ago and plan to go back again this year. It was just perfect, and the campervan area was nicely sheltered from the wind, and free from the horrible designated pitches that so many campervan sites have - we rolled up where we could enjoy the shade from the (at the time small) trees, have a peaceful campfire with some privacy, but still have the comfort and enjoyment of waving hello to neighbours. Facilities were exactly right, and the owners were warm and welcoming. Will be back again without fail! Quite simply, a stunning campsite. Exactly the type of thing that I want in a campsite, plenty of room, relaxed, great ethos. Cannot recomend it enough. Just come back from a wonderful visit to this campsite. Friendly owners, lots of space, beautiful scenery, wildlife, tranquility and relaxation. Despite it being mid August we had loads of space. The kids could run and scooter to their hearts content without getting in anyone’s way. The compost loos were great, showers hot, facilities spot less. Lovely walks right from the campsite, delightful little town of Nailsworth just a few minutes drive away. We will definitely be back to this wonderful site. A very special place! Many acres of space, beautifully maintained with good facilities but still manages to feel remote and natural. The only noise is birdsong and night visits from badgers and deer! Without a doubt 5 Star rating. Lots of space, wildflowers, sky, birdsong, and views. Member of staff that performed meet and greet was spot on, facilities are basic but good. Other pluses, campfires are allowed, as are dogs - two essentials for me. Faultless weekend. My boyfriend and I just spent the weekend at Thistledown Farm and it was brilliant. From the moment we arrived the reception was friendly and the campsite itself is really beautiful. Walking locally is a must and the pubs in the surrounding villages are a nice way to break up a day of walking. They only allow a certain number of pitches which means it never feels over crowded. Having a fire pit is a must and the views are amazing. The facilities are great and built in wood to keep the overall look of the place really beautiful, and the showers are hot which is brilliant. All in all we had a great time will definitely be going back. If your looking for a campsite that is thoroughly in touch with nature this is the one. The management were friendly and informative and the people of Nailsworth, Nympsfield and Uley couldn’t have been more welcoming. This site is perfect for those on a walking trip and the farmers market in nearby Stroud every Saturday is well worth a visit. There are shops and pubs nearby but far enough away for a real adventure. A wonderful stay and we can’t wait to go back! This is certainly a very ’cool’ campsite. From its eco credentials, the stunning landscape, cute piglets, and the campfires, the whole place is simply beautiful! The owner is such a lovely guy too, had a great chat with him when he gave us a lift in his little buggy! We stayed in the 3rd pasture and loved it. Undulating, with lovely mature tress, long grass and some blackberries to pick - it was perfect! And we were impressed by the composting toilets! We would recommend this to anyone, couples as well as families, because there is enough privacy and space between each pitch that you aren’t bothered by anyone else. We will defintely be back! I love this place. True, the compost toilets are a culture shock to the uninitiated, but they are clean and as attractive as could be; the showers are spacious, the water hot and the pressure high. Get over the loos, and enter a cool camping nirvana. The management are friendly, helpful, unobtrusive and laid back - but run a well organised site. Even in August, every tent had plenty of space around it, at least down in the lower fields. The surroundings are beautiful - from the field and the valley, to the local villages and towns. It took a visit to a campsite in the New Forest (a hellish place which inexplicably gets a mention in the coolcamping website) to realise how lovely Thistledown Farm is. We have just spent a fantastic weekend camping at Thistledown. We took a group of friends for a 30th birthday celebration and had a great time. There is no problem camping as a group, and we had masses of spaces and loads of privacy. We choose to camp right at the bottom of the site in a secluded area, with trees a large fire pit and gently undulating ground. It was truly beautiful. There were several reasons i chose this site, they welcome groups, they allow fires and the site is beautiful and eco run. I wasnt disappointed with any of these points. They deliver ample amounts of firewood to your site each evening, and the toilets and shower facilities are beautifully clean. They are compost toilets, which is great for the environment, but they are also like any other toilet blocks complete with toilet roll, lamps and even potted plants in the cubicles! The hot showers were lovely too. We didnt have chance to visit any of the animals or do any of the walks, but we will definately be going back to do this at another time. Our group was mainly adults but we took our two 2 year old twins and they loved it. They could run about to their hearts content, with no worries of cars, or them running off, and so much to around them to keep them interested. Only negatives i would point out are: beware it is a long hard walk to the bottom of the site, but you can pay for a lift in the jeep. You can camp at the top of the site though, so it is down to personal choice. I do think however, that it is worth the walk to camp in the most beautiful, peaceful campsite i have been to so far! There are a lot of thistles in the grass, but to be honest, none of us really got stung, just need to be aware of it. Also should point out that there are ticks in the area. Not sure if we got them off the site, or when walking locally, but a few of us did find them on us after getting home. Not a reason not to go, as its part of being in the countryside, but just worth bearing in mind, and worth checking yourself over just in case. Would definately recommend this site, we will definately be going back. The owners are very friendly and helpful, and the site is trully beautiful. Good location too, and very easy to get to. Love it here.. very peaceful and rather pretty. We camped in the top field in the elderberry orchard, you can park next to your tent here so easy for loading and unloading. Also the orchard offers some privacy, so even when busy you’re never quite camped "right" next door to the next person. Plenty of firepits and a generous barrow of wood for £10. Toilets in the top field are just portaloos, but they’re clean and well stocked. Take a stroll down to the other fields to use the compost loos and shower if you need to. Friendly welcome, a useful recyclables collection each morning, and a great location all make this a perfect spot. If you want laundry facilities, and laid on entertainment - stay away, you’ll hate it. 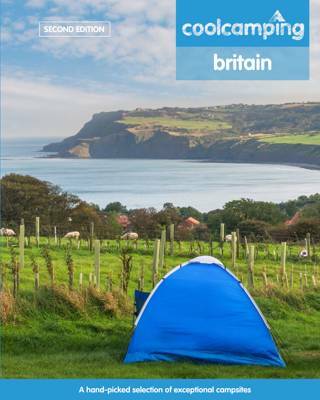 If you like basic camping in a lovely environment - you’ll like it here. Tip: take a trip to the farmers market in Stroud on a Saturday for yummy things to bring back and cook. Tents, groups, dogs (on leads) – yes. Campervans – yes (in elderflower orchard). Caravans – no. 75 unmarked pitches spread across 3 main camping areas: the elderflower orchard (20 pitches), where cars are allowed, and the car-free second (20) and third (35) pastures. The lower pastures are more sheltered and have composting toilets, hot showers and washing-up sinks. The elderflower orchard has events toilets only, but you can walk to facilities in the lower pastures. Campfires allowed in pre-dug firepits. The site has numerous walks, a lake and a birdwatching hide. Wood is available to buy by the bagload (£6.50 softwood / £7.50 hardwood). A shop sells local produce. The only thing upstaging the mahoosive camping space, ancient valley views and wildlife-friendly ethos is the campsite's own café. It's difficult to think of any reason why you'd even need to leave. A walk through the woods from Thistledown will take you to the fascinating Woodchester Mansion and Park (01453 861541). The house is an unfinished Gothic manor, so you can open doors that go nowhere and get an idea of the building process. Don’t visit after dark though; it’s haunted… The area surrounding Thistledown is also known for its burial mounds. The Neolithic Nympsfield Long Barrow has spectacular views over the Severn Valley, as well as internal burial chambers for viewing. Just along the ridge is the Uley Long Barrow (aka Hetty Pegler’s Tump) – take a torch if you want to see inside. On the other side of Stroud is the beautiful Slad Valley. The Fieldfare Café onsite has everything you need. Lamb comes from Thistledown Farm itself, so to does the herbs and salads and the menu uses locally sourced produce where possible. Foodie heaven Nailsworth is also only 3 miles away, where Hobbs House Bakery sells sublime bread and William’s Foodhall is an upmarket deli. Stroud Farmers’ Market is open every Saturday 9am–2pm. Good local pubs offering food include the Old Spot Inn (01453 542870) at Dursley, with its own microbrewery, and the Black Horse (01453 872556) at Amberley. For a pub within walking distance, try Nympsfield’s Rose & Crown (01453 860240). Weather dependent, usually April – October. 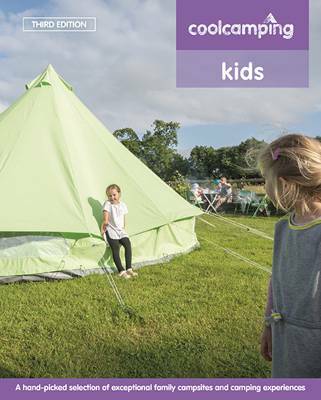 Tent £10 per night + adult £8; child (over 4 years) £4; under-4s free. Dogs £2. Camping £5 in elderflower orchard if you arrive by foot, bike or public transport. Train to Stroud, then (twice-daily) bus no. 35 to Nympsfield. Then it’s about a 15-minute walk. Please see our website for public transport options.